The following are detailed specifications about the Modern Ceiling Fan with Light with White Glass in Brushed Steel / Matte Opal Finish. 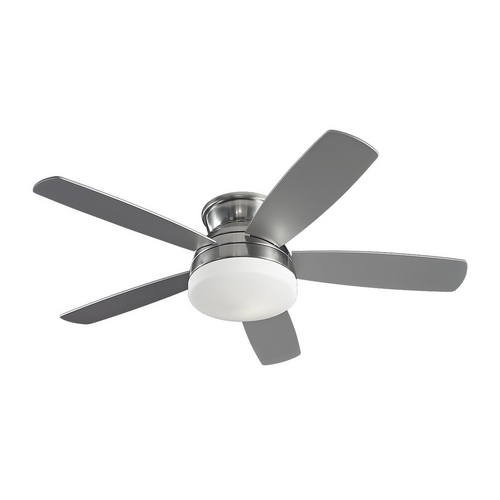 Modern brushed steel / matte opal 1-light indoor ceiling fan. Monte Carlo Fan Company has been creating and manufacturing fans for over 15 years. The Monte Carlo Fan Company is known for having developed an enviable reputation for combining style, technology and design. Can't find what you're looking for? Give us a call at 1-800-653-6556 or send us an email at customerservice@destinationlighting.com and we'll help you find the product. With our 14 physical stores and close relationship with our manufacturers, we are able to provide accurate answers faster than other online retailers. 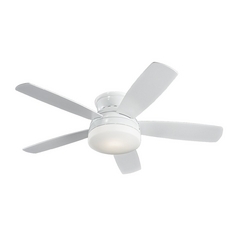 This Modern Ceiling Fan with Light with White Glass in Brushed Steel / Matte Opal Finish is part of the Traverse Collection from Monte Carlo Fans. The following items are also part of the Traverse Collection.